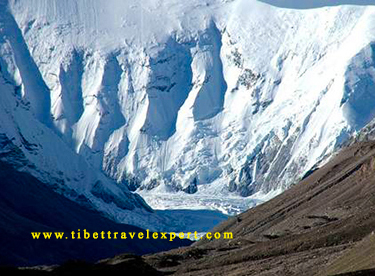 The Rongbuk Glacier locates in the Himalaya of southern Tibet, only 300 meters away from the Rongpuk Monastery. 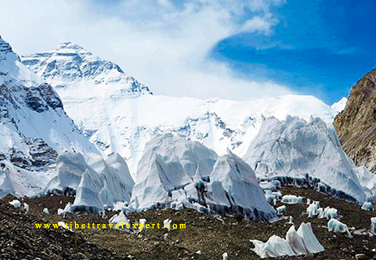 It has two large tributary glaciers, the East Rongbuk Glacier and the West Rongbuk Glacier, respectively, flow into the main Rongbuk Glacier.The main Rongbuk Valley and its glacier was first explored by an English climber, George Mallory, while searching for possible routes to the summit of Mt. Everest in 1921. The East Rongbu Glacier was explored by Edward Oliver Wheeler in the same year. He found that the East Valley provided the key to a possible route to the summit of Mt. Everest. 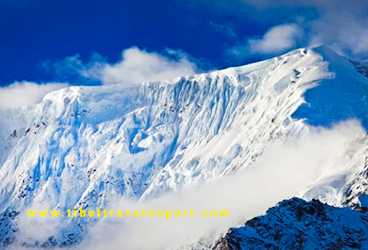 Travelers who entering the crystal and icy world will be surprised by Nature’s creativity. 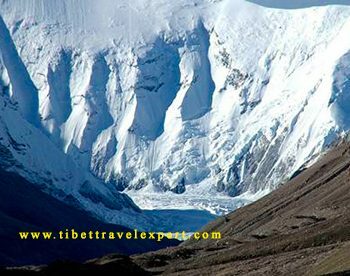 The glacier will definitely make visitors to regret not having one more eyes to fully appreciate the beauty of nature. 1. Ice climbing is an extreme sports. 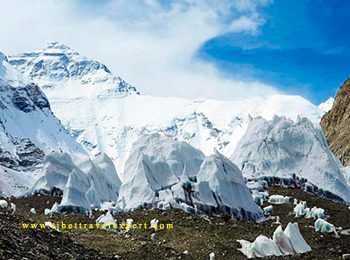 Please take professional gears with you when climbing the Rongbuk Glacier.